When you are organizing your jewelry, a necklace tray might be just the thing to keep necklaces and pendants neatly stored and free from dirt and dust. Necklaces are a beautiful type of jewelry that need to be correctly stored in order to keep them looking in tip top condition. 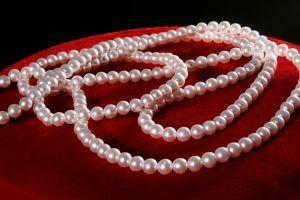 If necklaces are put away with other items of jewelry they can often get tangled up with earrings or other small items. Pendants typically consist of an item hanging from a chain. This might be a locket, a symbol such as a crucifix, a special birthstone or simply a beautiful item. Storing a pendant in a necklace tray ensures that both the pendant and necklace are safely stored and do not get damaged by getting tangled up with other items. Very delicate pendants can easily get knocked, scratched or marked against other items and therefore a necklace tray will keep them safely stored. Wrapping a pendant in a piece of soft, lint free cloth will also help to keep it clean and free from damage. Chains must be stored without twisting. A jewelry organizer like a necklace tray is ideal for keeping chains free from getting twisted or tangled with other items. When a chain gets twisted, extra pressure is put on the links and there is risk of causing weakness in the chain. This can result in the chain breaking which can mean that a pendant gets lost. Beads and pearls are often threaded onto thin silks. While these silks and threads are hard wearing, they can get damaged and rough or sharp items can cut into the threads. Colored beads may also get scratched and just a single scratched bead can reduce the overall look of a piece of jewelry. Storing beads in a necklace tray reduces the risk of damage. It also stops the beads from knocking into each other and causing damage. Number of necklaces to be stored. The type of necklaces. Lots of large beaded necklaces, for instance, will take up more space than a delicate chain. Whether the necklace tray needs to match or complement other jewelry organizers or boxes. A necklace tray might also need to go with other bedroom accessories. Does the tray need to be in some form of lockable container, for instance, if valuable jewelry is to be stored in it. A necklace tray is a useful way to keep necklaces in perfect condition and the wide variety available means that there is bound to be a tray available to meet every jewelry storage need.